Portions of this column were originally written for the February 2011 edition of News Photographer Magazine. After 16 years I'm going to stop tracking a statistic. The percentage of Americans who subscribe to a daily newspaper is the EKG tracing for an industry. After the new figures come out in June, that will be it. It just doesn't matter anymore. Printed newspapers long ago stopped being a relevant part of most Americans' daily lives. The familiar daily newspaper content is a mass-market product with a rapidly disappearing market. The journalists who serve that market see themselves in a public-service/artistic role that is above tawdry concerns such as cash-in-hand. But it serves no one to vilify profitability. It is far more constructive to become part of the solution by inventing, developing and exploring new ways to monetize journalistic content. 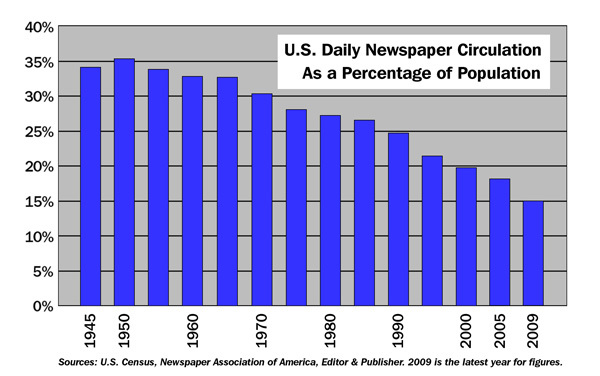 The problem with print is that the number of people who read newspapers is shrinking along with advertising. That means that the cost of printed papers will either have to go up (good luck with that) or publishers will have to stop providing them. What consumers don't want is clear. They don't want paper. They want their constantly updated multimedia content delivered to them in their cars, in movie theaters, in their hospital bed — wherever they happen to be. And they want to have a direct hand in forming it. Print-based general news products are going away. But as long as the print product is still there, the online product is going to be handicapped. Advertisers are used to buying print and will keep doing so as long as it's still being offered. What I'd like to see is a major metro having the courage to pull the plug on its print product and sell the presses. Although gross revenues will be lower at first, the elimination of the massive print production and distribution costs will still allow significant profits. That is if management is savvy enough to improve the product by rolling some of the expense costs over to the newsroom. "People aren't switching their media consumption from analog to digital for the sake of digital," wrote digital media consultant Vin Crosbie. "Indeed, most find reading a newspaper, a magazine, or a book to be easier on paper than via a computer screen; or watching a television program on a television set or a movie on a theatrical screen to be a better experience than doing so on the smaller surface on a computer screen. The actual reason why people are switching their consumption is because digital gives them extraordinarily more choices and access to news, entertainment, and information." Even what we call ourselves is passé. TBD's Director of Community Engagement Steve Buttry wrote, "The traditional job titles of editors, reporters and photographers are painfully out of date, and the new titles seem inadequate, so I'm just calling them all journalists..."
User-created content is not just cheap (free,) it is also highly desirable as a way to engage viewers and encourage brand loyalty. It is not going away. So-called citizen journalists are going to be part of the mix. Technology has made it not only possible but inevitable. It's a matter of supply vs. demand. (Not to mention desire on the part of consumers.) Currently, there is insufficient demand for original reporting for the market to pay for very much of it. That's why newspapers are shedding journalists. Eventually, the supply of high quality journalism will reach a balance point with the market that supports it. Some of that demand will come from businesses and business models that do not currently exist. And yes, much of the supply will come from independent journalists. The term "blogger" will fade away just like "home page." Paid journalists will survive based upon their market value. They will not be able to force that value by being outraged about market changes. Not only will they have to sell and promote themselves like every other product, they will also have to generate content that is valued by the market. When it comes to spot news, first beats better every time. Since pro photojournalists can't be everywhere, spot news has become the purview of cell phones and surveillance cameras. Well-crafted professionally produced images are relegated to "second day" packages, if that. If professional photojournalists are going to survive, complaining about being marginalized for spot news is not going to help. Instead, they need to identify and/or create content streams that not only require a higher skill set, but ones that are desired by enough people to make a financially viable critical-mass audience. The next time a flag is raised on a future Iwo Jima, the enduring image will be pulled from Marine videographer Bill Genaust's live helmet-cam feed. Joe Rosenthal will not be there at all. Robert Scoble is, by far, the best-known employee of Rackspace, but you have to search to find any mention of him on their website. Scoble is also one of the best-known names in tech journalism, but he doesn't work for a media company. Rackspace is a Web hosting and managed-server provider. But Scoble is not merely a paid shill for the company, in fact, he rarely mentions it. By covering the tech start-up space, he promotes a major source of Rackspace's potential market. A mention by Scoble can be like getting your book mentioned by Oprah. At Rackspace, business and good journalism are on the same team. News.me is a New York Times joint-venture news platform based upon the user's Twitter stream. When you sign in, you see a stream of stories viewed by the people you follow in their Twitter streams. You become your own default editor simply by choosing whom to follow. But there still needs to be original content at the beginning of the links. Last year 724 news outlets launched. 688 of them belonged to AOL's hyperlocal effort, Patch. Patch follows a formula approach placing a single journalist in a suburban market with a freelance budget equivalent to the cost of a full time employee. Berkeleyside founder Lance Knobel wrote about Patch for the Nieman Journalism Lab, " The constraint for local sites isn't technical infrastructure or Web skills — it's finding the right people who combine a passion for their town or city with real journalism skills..."
In the Los Angeles suburb of Brentwood, Patch editor Dennis Wilen covers the area he's called home for more than 17 years. He knows the turf and he has insane media skills. If Patch can maintain that level of hiring, they have a shot at being a serious media player in the community. However, with an estimated $30 million per quarter going toward Patch, AOL has put all their chips on black. They have to win big or go home on the bus. The odds against are long. - Founded in the depths of the recession, MinnPost.com is an online non-profit local that declared its first surplus in 2010. - Oaklandlocal is another non-profit that is reaping national kudos and a broad local following. Editor/publisher Susan Mernit is a new media vet of the highest order. - Once named one of the "Ten Worst Managed Companies in America." The Journal Register Company has come back from bankruptcy with a widely hailed "online first" philosophy driven by visionary CEO John Paton. Its "Ben Franklin Project" explored ways of publishing a newspaper using only free online tools. - A printed newspaper in Norway, Fredriksstad Blad is making the difficult transition away from paper. It has allocated 50% of its resources to its online product. - The cantankerous Howard Owens' definitely profitable community news site southwest of Rochester, NY recently announced its first two staff hires. - The non-profit Texas Tribune is forecast to break even on $3 million in revenue in 2013. - With 18 editorial staffers and a healthy endowment, The Bay Citizen also produces a two-page Bay Area Report for the New York Times San Francisco Bay edition. The company, along with the Texas Tribune, recently received a $975,000 grant from the John S. and James L. Knight foundation to develop an open-source content management system for news organizations. - The Poynter Institute announced that the Chuck Fadely-led Miami Herald video department is now the second biggest driver of traffic to the Web for the Herald. Let's hope that they can transcend the double handicap of the print product and corporate ownership. In the Bible, Moses wandered in the desert for 40 years after escaping Egypt so that the new inhabitants of Israel would be of a generation that had known only freedom. Breaking past the physical barriers of print is something that may be beyond the vision of those who have been beaten down by the past four decades. Not only are we re-inventing news delivery, we are re-inventing ourselves. Portions of this article were originally written in online postings and emails dating back to 1991.